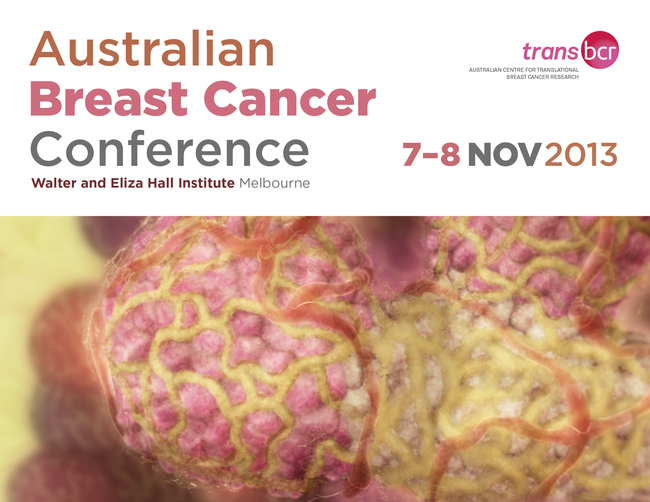 On behalf of Australian Centre for Translational Breast Cancer Research (TransBCR), I am delighted to invite you to join us at the Australian Breast Cancer Conference 2013 (ABCC 2013), which will be held in Melbourne from 7 - 8th November 2013. The conference will begin with a Public Lecture to be held the evening of 6th November 2013 at the Walter and Eliza Hall Institute of Medical Research. The public lecture is a free event, however separate registration is required. Please register here for the Public Lecture. The conference dinner is included in the registration fee but for catering purposes, please indicate if you will be attending during registration. The dinner will be held on Thursday 7th November at University House from 6pm. University House is located within the grounds of the University of Melbourne (across the road from the Walter and Eliza Hall Institute of Medical Research). Please also indicate any dietary requirements during registration. The Australian Breast Cancer Conference 2013 will provide a forum for international and national speakers to present their basic and translational research to researchers and clinicians. The meeting will be hosted by the Australian Centre for Translation Breast Cancer Research (TransBCR). TransBCR will bring together a collaborative group of researchers from several Australian hospitals and research institutes to help accelerate the pace of translational breast cancer research. We look forward to welcoming you to Melbourne in November 2013.